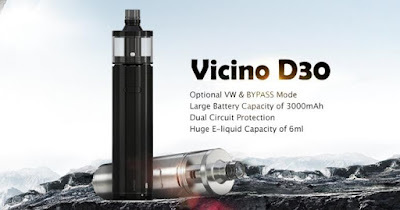 Wismec Vicino D30 Starter Kit is the updated version of Wismec Vicino Starter Kit,comes with 6ml Atomizer and 3000mah large Battery . It also has battery power display, you can know your battery quantity in anytime. Two sets of circuit protection system are applied, realizing the overall protection of over-charging, over-current and over-discharging. When working with the equipped high power atomizer head, you can get unexpected large vapor and great flavor.